Hey! That's me in the "Man-Basket"! We are cruising from Site 2 to Site 3 today. We should get there mid-day tomorrow. We have entered the Mountain Standard Time Zone, the first of five time zone crossings. On these days of transit, we finish up any work that needs to be done on from the last site and prepare for the next site. Today, I wrote up the "Lithologic Description" for Site 2, finished crunching the data, and cleaned up our lab station. I went outside for a while and watched the very smooth water that we are cruising over and watched a huge pod of dolphins (at least 50 according to one of the scientists). In the man-basket, working on the bottom end of the Long Core mechanism. 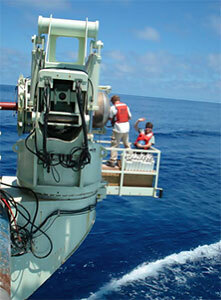 When I was out on deck, one of the coring crew, Larry Costello, asked if I could give them a hand with the long core. Given that each section weighs between 500-2000 pounds, I wasn't sure how I could help. They tossed me a life jacket and a radio and had me hop into the "man basket" a metal-framed basket that swings out over the stearn of the ship allowing us to work on the bottom end of the long core. We strung a long stiff wire though the core liner. Larry and Chris Moser were at the other end where they attached the wire to the cable that lowers the coring system to the bottom. We pulled the wire back through the core and set it. This whole time I am standing in a metal basket, moving 12.5 knots 5 meters above the crystal blue equatorial Pacific water. I was able to get a good look at just how inviting the water really is. Unfortunately, we can't go swimming. Bummer. Larry has been working on the R/V Knorr for 31 years. He was the crane operator in 1985, when a team of Woods Hole Oceanographic Institute researchers were working with French researchers to discover the RMS Titanic. Larry was inspired by all the television specials he watched of the adventures of Jacques Yves Cousteau. 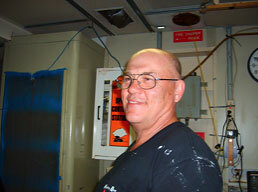 Today Larry works for WHOI as a technician for the long core operations. He attempts to eat eight crackers in a minute, and teaches us all the art of knot tying. How many time zones are there between Costa Rica and Hawaii? What does the word "lithologic" mean? How fast is a knot (the unit of velocity, not the kind in a rope)?